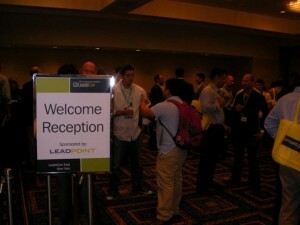 This was my first time at LeadsCon which is a relatively new show. I was unsure what to expect but I had heard good things in advance. It was small but it lived up to high expectations. The Sessions were good and well attended. The Exhibit hall was also small with about 40 booths and they were in general the people that I see at other shows. However what I would say it that it was busy all day and everyone I spoke to said that they were getting a good number of targeted leads and would be back again to exhibit at the next show. As an attendee looking to both buy and sell leads as well a generally network it was a good event and I made some good contacts. Would I fly over from London again just for this show as an attendee? Yes I would. The quality of contacts at this show was very good.